What if the objective of minimizing unit product cost that is hard coded into all reporting and measurement systems is simply "bad math" that drives decisions and actions that destroy ROI? In today's volatile, globally competitive environment, new decision-making tools are required to monitor, measure, and improve total organizational performance. recognized experts in the field, Demand Driven Performance explains why current measurement forms must be replaced. 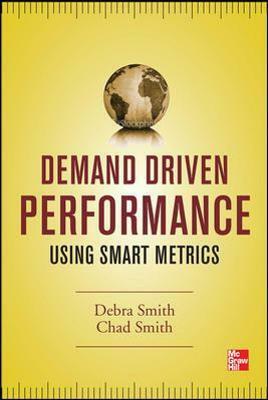 The authors present a demand driven blueprint and the smart metrics to maximize flow and ROI. "The methods described in this book worked in one of the most complex manufacturing operations that you can imagine with very effective results." -- From the Foreword by Dan Eckermann, former President and CEO, LeTourneau Technologies, Inc.
Debra A. Smith, CPA, EMBA, is a cofounder and partner with Constraints Management Group, LLC, a services and technology company specializing in pull-based manufacturing, materials, and project management systems for midrange and large manufacturers. She began her career in public accounting with Touche Ross (now Deloitte Touche), moved to the private sector where she worked as both a controller and a VP of finance for two different publicly traded firms, and then spent seven years as an accounting professor where her research focused on the role of metrics in process improvement. Ms. Smith began working with Dr. Eli Goldratt in 1990. She was elected to the founding Board of Directors of the Theory of Constraints International Certification Organization, serving five years and is certified in all TOC disciplines. Ms. Smith has been active in the Institute of Management Accounting (IMA) and APICS and a keynote speaker on three continents. She is a coauthor of The Theory of Constraints and Its Implications for Management Accounting, the recipient of the 1993 IMA and Price Waterhouse applied research grant, a contributing author for The Theory of Constraints Handbook, and the author of The Measurement Nightmare. Ms. Smith has been at the forefront of developing and articulating smart metrics. Chad Smith is a partner with the Demand Driven Institute and is a cofounder and Managing Partner of Constraints Management Group, LLC. He has been at the forefront of developing and articulating the blueprint for planning and execution in the twenty-first century-Demand Driven MRP (DDMRP). Mr. Smith is the coauthor of Orlicky's Materials Requirement Planning, Third Edition and serves as the Program Director of the Certified Demand Driven Planner (CDDP) Program for the International Supply Chain Education Alliance (ISCEA). He is a frequent consultant to large multinational manufacturing and supply chain companies. Mr. Smith is an internationally recognized expert in the Theory of Constraints and is a contributing author for The Theory of Constraints Handbook.